When will compound archery become an Olympic sport? 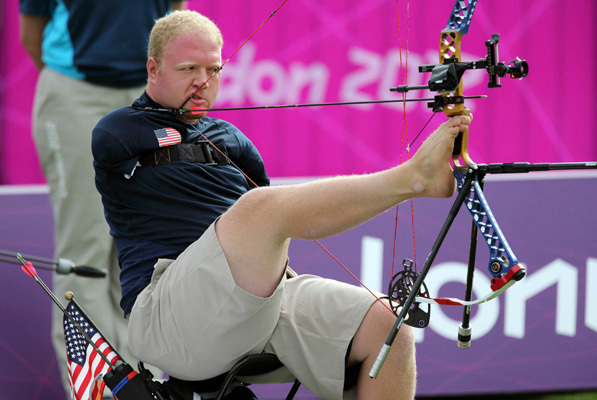 With just a few hundred days to go until Rio, there has now been a pair of posts by USA Archery speaking with Tom Dielen about if, how and when compound archery would be introduced to the Olympic Games (it has been a part of the Paralympics since 2008, of course). I have compiled both of them below into one interview. There is already a plan submitted to include a recurve mixed team event at Tokyo 2020, which is a much easier sell to the IOC as it would not increase the number of athletes. Keeping the number of athletes for the Summer Games down to 10,500 is a key tenet of the Agenda 2020 proposals which are designed to reduce the cost and complexity of hosting the Games. There are logistics issues too: the four medal archery programme at the moment with 128 athletes already monopolises a large venue for a week, so in order to have a compound competition either the programme would have to be significantly extended, the venue redesigned (presumably to four lanes) or the total number of athletes kept at the same or similar number, which would significantly change the recurve competition. It seems very unlikely to be introduced at Toyko 2020, so if it does happen, the 2024 Games will be the earliest we see the bowstyle appearing. I suspect a lot depends on the continuing popularity of the Olympic competition in Brasil and Japan for a worldwide TV audience. Here’s hoping. What if compound archery was an Olympic event? The benefits to archery are clear: There would be increased exposure for the sport, and the opportunity for more Olympic archery medals. After all, archery is archery – no matter what bow we shoot. But is it even possible for compound archery to become an Olympic event, and if so, what would it take to make that happen? For the first in a series of articles on this very hot topic, we talked with Tom Dielen, the Secretary General of World Archery. It’s incredibly difficult to count the number of archers worldwide, independent of the bow they shoot: There are all those who shoot casually at a club or aren’t members of a federation, or visit centers or shops. What we can easily count is the number of elite athletes competing at World Archery events and compare how many of these are compound and how many are recurve. Over the 2014 season of World Championships (indoor and field) and Archery World Cup stages, we had 909 recurve entries and 653 compound. That’s about a 60:40 split. In some of our larger member associations (national archery governing bodies), you would find more of a 70:30 split based on participation at national competitions. We know that the number of casual compound archers is large, especially in North America, but we’re aiming to convert these people into competitors in the sport. Compound archery was first included in the World Archery Championships in 1995 – after an introduction in field and indoor disciplines earlier on. It was only three years before that when World Archery introduced the head-to-head system to recurve archery, a competition format that greatly increased the event’s value to the Olympic Program. A first request to include compound into the Olympics was made by Jim Easton in the late 1990s. However, the feedback received at that time was that it was impossible to add athletes, the disciplines were too similar, and that compound lacked universality (appeal and involvement from many different types of countries). What’s more, at that time, the position of archery was not as strong as it is now. Getting a sport or discipline added to the Olympic Program has not been a quick process. Sports were voted in and out only at meetings held every four years – and there was little turnover. However, the situation changed slightly last December, when the International Olympic Committee (IOC) accepted the Agenda 2020 recommendations that shifted the Olympic Program from sports-based to event-based. World Archery would like to have more archery events and more medals at the Olympic Games. The first goal is to add the mixed team to the recurve event, as this is quota neutral – meaning it does not increase the number of athletes. It would be fantastic for the sport and its exposure internationally and in individual countries to include compound athletes in the Olympic Games. There is the example of India at the Asian Games, where compound was introduced for the first time in 2014. The nation made the top 10 rankings thanks to four compound medals in archery. Nowhere does it say whether these were compound or recurve medals; they count just the same, and as archery. Having said that, compound archery is already in the World Games – a multisport event that has been growing at an exceptional rate. The next edition is scheduled for Wroclaw in 2017, and then the World Games will head to Birmingham, Alabama in the USA for 2021. At Cali [Colombia] 2013, there were huge, full spectator stands for the compound event. Birmingham 2021 is a real opportunity to showcase the sport – and what’s more, the IOC has signed an agreement to work closer with the World Games as a result of Agenda 2020. The IOC basically sees the World Games as a test platform for new events. Therefore, we all have huge interest in delivering a great compound event at future World Games. Together with USA Archery, we should aim to have 10,000 spectators watching the finals in Birmingham. World Archery is also working to have compound added to other Continental Games, following the example of the Asian edition, as another way of increasing visibility. There are many areas of assessment for new sports events in the Olympic Games. They range from participation, popularity, gender balance and competition level, to engagement with youth, integrity and individuality. One essential factor is television appeal. Compound archery has the qualities of an Olympic discipline – but it will be up against tough competition like skateboarding, squash, wakeboarding and 3×3 basketball. For the 2016 Olympic Games, along with the 26 Summer Olympic sports from London, there were 23 additional requests from sports to join the event. We are not the only ones with great ideas! Now that we’re excited to see compound archers in the Olympic stadium, what can specifically be done to add compound archery to the Olympic Games? How can archery fans support this effort – and how are governing bodies working to make this change? Keep an eye out for our next article in this series, which will explore next steps for this initiative. How would the addition of compound potentially benefit the sport of archery? There would be increased exposure, the opportunity for more Olympic archery medals. It would give more chances for different countries to win medals. Is there any sense of how soon compound might become a part of the Games? It will not be a quick process, but each step along the way will be beneficial. Realistically, we are possibly looking at 2024, but more likely 2028. What are some of the changes that must be made in order to have compound added? We have to raise the level of competition in the discipline, not in terms of the top archers but the depth and variety of the field. Compound archery is popular in some countries – like the USA – but the Olympics is a worldwide sporting event and many less developed nations simply do not practice the discipline. At a most basic level: the availability of equipment and technical expertise. The other critical element is the gender balance in all aspects. This means in participation but especially in performance level. At the moment, the level of compound women’s elite archery is not the same as the men’s. At the last World Championships, 28 points separated the women’s top 30 athletes over the qualification round – only 14 points the top 30 men. This pattern is echoed across other major events. Alongside our development work, more investment needs to be made by member associations and manufacturers to make this a reality. Equal prize money in all events (World Archery already has this) is another related aspect to work on. There’s also work to be done in event presentation – making compound more and more appealing to a live audience – communicating the successes, stories and challenges of the sport more effectively, and working to maximize that “cool” factor of archery in the movies. We tested a number of competition formats over the past few years – and that is part of the process of developing a sport product that is different enough to the recurve event to have a chance of being included. We need to develop archery’s version of beach volleyball. It doesn’t need to be on a beach – but we do need to make it different enough from recurve archery to enhance the appeal! How is World Archery working to help make these changes? Continued development of the compound competition format, presentation and standard, and our international events, is a huge part of the process. The shift to include compound archery in the World Games – the first being the 2013 event – another initiative, plus the discipline in the first continental multisport event last year. We also have had excellent compound competitions in the Universiades and the Commonwealth Games. We are making changes to how we present athletes on our website and encouraging high levels of social media activity among archers – another marker the IOC assess. Our development department works hard to promote archery of all levels in nations growing in the sport around the world, and we have an equipment assistance program sponsored by many archery manufacturers. During the ATA Show, World Archery met with manufacturers to explain why we have put in place the rule against athletes using camouflage equipment at international events. As well as safety (in field and 3D) being a factor, the move is largely about the presentation of the sport looking towards the Olympics. Camo would not be allowed at the Games – and if we truly want compound archery into the Olympics, then we need to make it a sport that we can successfully submit to the IOC for inclusion. At World Archery target events (world championships and the Archery World Cup), the compound and recurve competitions are equal. We use Saturday as the compound finals day and Sunday for the recurve – both with identical schedules and prize money. Is there anything that archers, coaches and others can do to help with having it included? Sports need personality and proactivity from elite athletes – as well as performance. Jesse Broadwater is a fantastic compound example: recently, his athlete Facebook page has grown to around 24,000 likes as he has put the effort in to better promote himself and the sport. It’s this kind of attitude that helps make compound in the Olympics a viable suggestion. At whatever level and in whatever field – be it as an athlete, a coach, a tournament organizer, a photographer or journalist, even in governance of a club, region, state, or country – it’s about presenting compound archery as a global discipline that everyone can enjoy, participate in and watch. Small things can help: wearing smart or sports clothes and shoes rather than jeans provides that positive sporting image to the external audience that we all know archery to have. If we want to be perceived as sportsmen and women in a real sports discipline, then we need to dress and act as such. Remember, it’s not archers that we need to convince that compound should be in the Olympics. It’s those who don’t shoot. Archery is archery no matter what bow we shoot. We all love the sport and we need to make sure we stay positive about archery as a sport, together – and give it the good image it deserves. If we work together, presenting a unified and larger group of athletes, then things will become easier and progress will be made. You may also want to read this piece from the NYT from 2012. I don’t understand why compound archery isn’t in the Olympics. I do feel that Olympic style recurve shooting would die a quick death if compounds were allowed. I think it’s time to catch up to the times and allow compounds. Aili, USA will have some VERY tough competition from South Africa in the 3D comps, we too are a hunting nation so the cards are up and we have the first challenge. South Africa has some top class 3D archers. I think there will be definite benefits to the sport if this does happen. The competitors will be and get better and better. Exposure will be more which will also have the bow manufacturers having to come to the party to meet with the competition demands. This will give rise to new opportunities on all fronts. The thinking is crazy. Why should there be a restriction on the number of athletes? Not all Olympic sports are fully televised, a lot are provided in highlight format as it is impossible to televise live every sport on at the same time. The Athletics only starts in week 2, yet they have 100m,200m 400m etc races, so the argument that the two archery styles are too similar is wrong. Get rid of half the track races then….. When did the Olympics decide that only sports that are popular for TV qualify, doesn’t that go against the motto of the Olympics? Like FIFA, it is now a corporate event, and the athletes are there to generate wealth for them. The Agenda 2020 initiative is designed to keep the costs of hosting down, and part of that is limiting the number of athletes and staff to 10,000 (if I remember correctly). Given the countless billions each event now costs the tax base of host countries, I don’t think this is a bad thing. Despite how big archery is as an Olympic TV draw, it’s not even in the same league as the athletics sprint events. We have to be realistic here. (I’m personally more baffled by the amount of medals that can be won in the pool). Personally I think that compound archery SHOULD be in the Olympics, but it will take smart thinking and action. Every sport is clamouring for more events and medals. The compound archery community needs to show the world WHY it should be there, and part of that is starting to make some of the changes that Tom Dielen has pointed out. In my opinion Compound archery is much too closely associated with bow hunting which makes it unappealing to many people. Compound also has a much more limited international footprint than Recurve. Anecdotally our club is currently seeing about a 9 to 1 beginner take-up in favour of Recurve compared to Compound. I wouldn’t mind Compound archery getting in but definitely not if it’s to the detriment of Recurve. From the Olympic committee standpoint I can understand the commercial struggles of fitting in a new event. However, they’re able to accommodate the myriad of target shooting categories (at the high point it had 15 events, the current count is 9 different events, including pistol and rifle, in mens, women and open) into the Summer Olympics, they could at very least fit the same number of sub-categories for Archery. The old arguments of equipment availability and costs doesn’t make sense either when compared to Olympic target shooting, especially when you compare the cost of a typical competition target rifle is almost three times as much as a high end target compound bow. Just a personal opinion, if you compare the amount of physical assists in target shooting (leather shooting coats, highly engineered air rifles and pistols, etc) to the physicality involved in compound archery, and their ability to attain a high level of accuracy at comparable distances, it’s hard to argue why compound shouldn’t be allowed into the Olympics. Not to pick on target shooting, but it’s the closest apples to apples Olympic category. If we want to talk about audience appeal, watch an indoor rifle match and watch a compound match, compound is infinitely more compelling. That being said compound scoring does need to be modified, perhaps adopt the set system as recurve. It is the only frustrating part about watching a compound match, if one competitor starts off poorly, the viewer knows the odds of them coming back is slim to none; there is little excitement left to the match. Thanks Nelson. I think it would be popular enough on TV, but the very current issue is keeping the number of athletes down as per the Agenda 2020 reforms. The trouble is: shooters (and swimmers etc) can compete in two or more disciplines at the same Games, so adding more medal events doesn’t increase the number of athletes. So adding an archery mixed team podium is an easy sell, but as archers don’t shoot more than one bow at elite level, adding compound means you have to justify many more athletes, totally redesign the venue and programme, all sorts of issues. I agree with a lot of the rest of what you say, but there are specific, IOC-mandated barriers to compound at present becoming an Olympic sport, particularly the lack of equality and particularly in North America – read carefully what Tom has to say about it. For example, the vocal lobby about allowing camo bows or clothing at major events is going to have to take up another cause. You can’t have it both ways. Cheers.